© Denzil GreenThe 4th of January is Spaghetti Day, according to many bloggers on the Internet. Enjoy a bowl of spaghetti; meatballs or no meatballs, it’s your choice! You might even want to try spaghetti squash. You should be aware, however, that there appears to be some disagreement or uncertainty as to when Spaghetti Day really is. Some sources plump for 13th July. The American National Pasta Association recognizes that Pasta Month is October, and has conducted surveys connected with this time period, but say in correspondence that they don’t actually sponsor the month. The October timeframe may have originated sometime between 2000 and 2003 with the “October is Pasta Month” campaign by the American Dietetic Association. 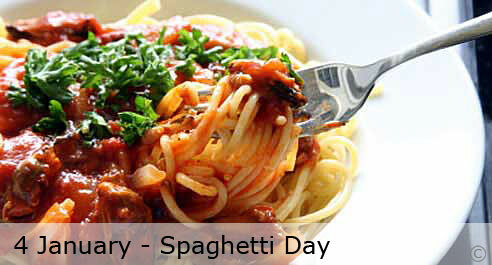 And, is Spaghetti Day really just one day a year? Or is a day of the week? In 1953, the advertising firm of Jerome O’Leary of Boston, Massachusetts created an advertising campaign for the Prince Macaroni Manufacturing Company (of Lowell, Massachusetts), owned by Joseph Pellegrino. The campaign centred around the slogan, “Wednesday is Prince Spaghetti Day.” The ads ran on radio, later moving to television as well as television became more prevalent. The campaign was a huge success. In the mindset of a generation, Wednesdays became equated with spaghetti days. The pasta company had started in the north end of Boston, and in 1939 moved to Lowell, Massachusetts and took on the name of “Prince.” The company was bought out by Borden in 1987.